This workshop will engage excerpts from Greg Tate’s book, Everything But The Burden: What White People Are Taking From Black Culture and Ta-Nehisi Coates book, Between the World and Me through both discussion and physical exercises of weight exchange—giving, sharing and holding the weight of other bodies. This year, 2015 has seen Black + Brown folks in the US and around the world publicly experiencing extreme violence and being forced to watch other black + brown folks/sprits/humans/bodies dragged, choked, broken, killed – in real life, on the news and for instant replay on the internet. These experiences have been highlighted by performative responses in politics + culture such as public debates, protests, songs + art. Think – The View, Black Live Matter Protest NYC, Kendrick Lamar (Alright) and Damon Davis’ lawn sculptures. LACE presents The School for the Movement of the Technicolor People, a large-scale installation and performance platform by Los Angeles based artist taisha paggett. This project, which takes the form of a dance school, is shaped by the question, “what is a Black dance curriculum today?” The installation itself, developed in collaboration with artists Ashley Hunt and Kim Zumpfe, serves as a temporary dance school, performance space and home for dance company, WXPT (We are the Paper, We are the Trees). The core of The School for the Movement of the Technicolor People is WXPT itself — a temporary, experimental community of queer people of color and allies, dancers and non-dancers alike. WXPT was conceived by paggett in early 2015 to expand upon the language and methods of modern and contemporary dance practices, to shift the ways dancers of color are positioned within the contemporary field, and to explore questions of queer desire, responsibility, migration and historical materials that inhabit our cultural imagination. The company consists of Joy Angela Anderson, Heyward Bracey, Rebecca Bruno, Alfonso Cervera, Erin Christovale, Loren Fenton, Maria Garcia, Kloii “Hummingbird” Hollis, Jas Michelle, Meena Murugesan, taisha paggett, Sebastian Peters-Lazaro, Kristianne Salcines, Ché Ture, Devika Wickremesinghe and Suné Woods. 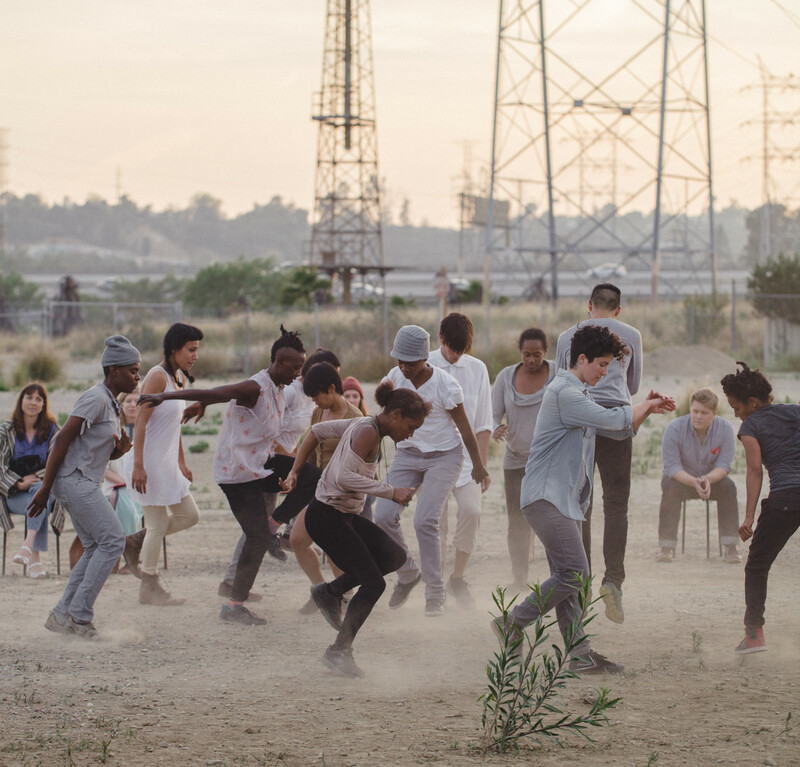 In May of 2015, paggett organized evereachmore, WXPT’s premiere performance created for the Bowtie Project, a partnership between Clockshop and California State Parks to activate an 18-acre post-industrial lot along the LA River. Amidst the recent unfolding of state violence against Black bodies, evereachmore sought to forge new economies of resistance, and new sensations of time, space and togetherness. Inspired in part by a “school for colored youth” that members of paggett’s family founded in early 20th century East Texas, The School for the Movement of the Technicolor People extends the praxis of WXPT into a curriculum and pedagogy. The installation at LACE takes up the form of a school as an artistic and social problem, building the school’s curriculum and infrastructure through physical and social sculpture, performance and image, where the roles of artist and viewer, dancing and non-dancing body, art and learning coalesce. The School for the Movement of the Technicolor People will offer a program of workshops, weekly classes and micro-performances initiated by members of WXPT. The curriculum will be open to anyone, blurring lines between audience and participant, while especially encouraging queer people of color to join. Across the bodies of the company and the members of the public who join the school, the curriculum will build an accumulative performance score in weekly increments, culminating in the performance of a “collective movement choir” at the conclusion of the exhibition. Image: Courtesy of Clockshop by Gina Clyne. The School for the Movement of the Technicolor People began as a conversation between paggett, Rodney McMillian and Cauleen Smith.